Mycenaeans and mysteries go hand in hand when it comes to the realm of history. But fortunately, while Homeric works allude to the vague idea of these ancient ‘Greeks’ of the Bronze Age, it is tried-and-tested archaeology (with painstaking efforts from researchers over the last century) that has brought forth a few surprising evidences and clues that help in painting a ‘credible’ picture of the actual Mycenaean culture and military. So without further ado, let us take a gander at the ten incredible facts you should know about the Mycenaean civilization and its warriors. Mycenaean as a term was probably as much ‘mysterious’ to ancient authors as the civilization is puzzling to modern scholars. In fact, Classical authors were not even aware of any singular Mycenaean faction – and given their Greek traditions, such writers often attributed the specific geographically-limited tribes as their ancestors, like the Achaeans and the Argives. Now, of course, the greatest example of Classical Greeks being inspired by their ‘ancestors’ comes from the epic poetry of Homer in the Iliad and Odyssey. And while the popular historical sentiment hints at how Homer was actually talking about the Mycenaeans, much of the Trojan War is set in a date that only tentatively corresponds to Mycenaeans. To that end, rather than a historical exposition of how Mycenaeans fought and behaved, the Iliad should be viewed more as a compilation of folkloric traditions that were passed down through generations from around 9th-8th century BC (three centuries after the passing of the Mycenaeans). Now, of course, given such ‘folkloric’ credentials, it doesn’t mean that Homeric works are completely devoid of actual historical scenarios. But as historian Nicholas Grguric mentioned, alongside the oral traditions, many of the storytellers also invented their own mythical stuff that was ultimately added on to the epic works. And in an odd twist of fate, it was the romanticism of Homer’s literary achievements that ultimately drew archaeologists to the previously ‘unknown’ Mycenaeans. That is because, in the late 19th century, it was Heinrich Schliemann, a German businessman, who wanted to prove to the world the actual existence of the Trojan War heroes. He came upon an ancient Bronze Age tomb with a myriad of grave goods, including gold, silver, ivory and ceramic artifacts (including the famed golden ‘Mask of Agamemnon‘). Though initially thought to be the royal tomb of Agamemnon, it was later assessed to be the burial complex of a dynasty that existed about 250 years before the supposed Trojan War (of 13th century BC). 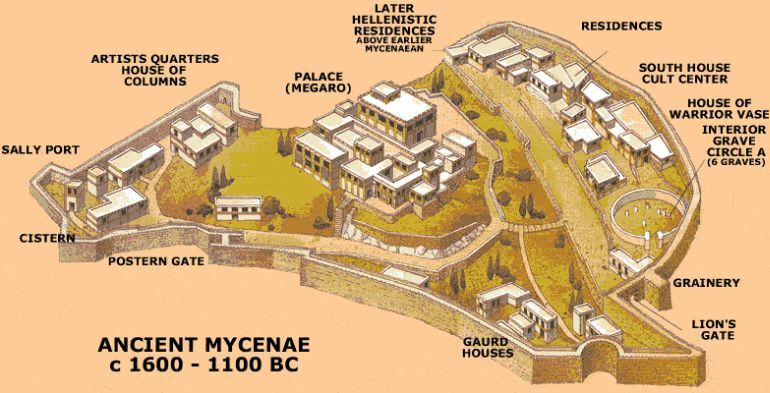 Thus a forgotten Greek civilization came to ‘life’ in the archaeological realm, and they were known as the Mycenaeans (derived from the fortified Mycenae site, in Argolid). Oddly enough, while the Mycenaeans themselves can be considered as ‘Greeks’, as judged by their decipherable Linear B script, the early phase of the civilization in itself (mostly based in mainland Greece) was markedly inspired by the distant Minoans hailing from the island of Crete. To that end, the earlier Mycenaean artworks, architectural patterns, and military arms, circa 1600–1450 BC, are very much similar to the contemporary Minoan styles – so much so that many early historians presumed the southern part of ancient Greece to be a colony of Bronze Age Crete. But that was not the case. 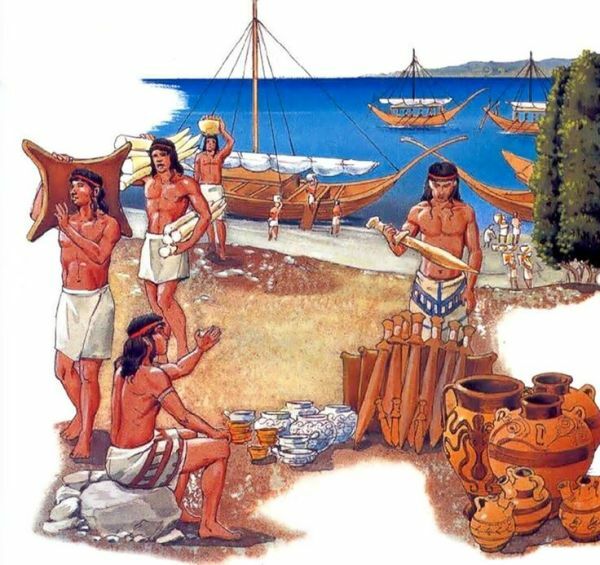 Rather the tangible influence of the Minoans on the ‘mainland’ Mycenaeans probably came from sea-based trading and exchange of materials between the two different cultures. In that regard, it should be noted that the early Minoans used the Linear A syllabic script – which is still undecipherable and conveys a language entirely different from the Greek dialects (unlike the Linear B). So in a way, the early Minoans could be possibly considered ‘non-Greek’ who had their lasting influence on the perceived ‘Greek’ characteristics (like art and military) of the Mycenaeans – though a new study potentially disputes this theory. Once again reverting to the twist of fate in history, by 1400 BC, the native Minoan civilization came to a halt – possibly due to cataclysmic effects of the volcanic eruption of Thera. The Mycenaeans took advantage of this chaotic period and pushed forth their ‘mainland’ culture in Crete. This reversal of influence led to the emergence of the famous Mycenaean site at Knossos, Crete. 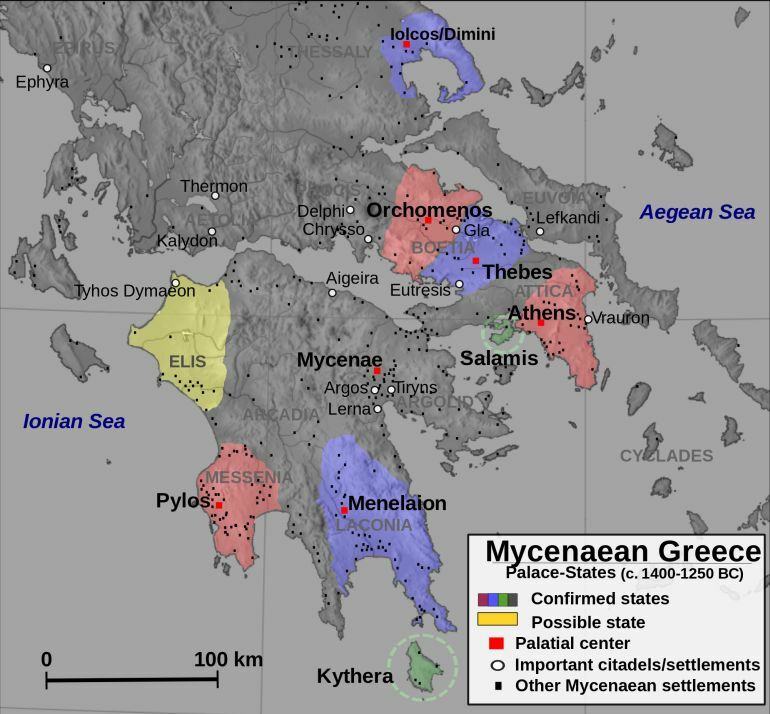 The Mycenaean ascendance was also reflected by their rising power in the proximate Aegean regions. Thus trade treaties were carved up with other regional powers, including the Hittites of Anatolia and Ancient Egypt. The cultural and military exchanges between these Bronze Age power-centers were evident from the employment of ‘exotic’ Egyptian and Nubian mercenaries in Mycenaean armies (and vice versa). Furthermore pertaining to an intriguing scope, at some point circa 14th century BC, the Mycenaeans may have even sent an expeditionary force to fight the Hittites allies of western Anatolia, thus oddly (though possibly coincidentally) mirroring the events of the Trojan War. Fortunately, beyond just Homeric descriptions, it was archaeology that proved to be the greatest asset when it came to identifying and knowing more about the military system of Mycenaeans. Evidenced mostly from pictorial depictions and extant grave specimens, historians are almost certain that the Mycenaeans, like their later Classical Greek counterparts, had a penchant for employing the massed ‘shoulder to shoulder’ formations of heavy infantrymen wielding stout spears. According to Grguric, these offensive weapons sometimes reached substantial lengths of 12 ft, with a socketed spearhead crafted from bronze. And as we mentioned before, one of these types of heavy spears used by Mycenaeans – with narrow leaf-shaped blades, was seemingly influenced by an original Cretan variety. Interestingly enough, there are pictorial depictions of the Mycenaean spears being wielded both by a single hand (like hoplites) and by two hands (like Alexander’s Macedonian pikemen). But when the ancient images depict the soldier using his spear with a single (right) hand, his shield is always drawn in front of the body. In other pictorial pieces of evidence, when the soldier is using his spear with two hands at the shoulder’s level, the shield is invariably slung back. In a nutshell, the heavy infantry possibly used both modes of handling the weapons, probably depending on the mass of the enemy and the regularity of the terrain on which they were operating. To that end, it should be noted that while the Mycenaean ascendancy in late 15th century BC brought them into contact (and conflict) with other foreign powers, the Mycenaeans mostly waged wars among themselves – much like their Classical brethren. So most battle scenarios involved the competing ‘palace-states’ (with centers of power and kingship being based around the palace of a settlement) vying for dominance in mainland Greece and proximate regions. The earlier paragraph naturally brings up the importance of shields in Greek warfare. 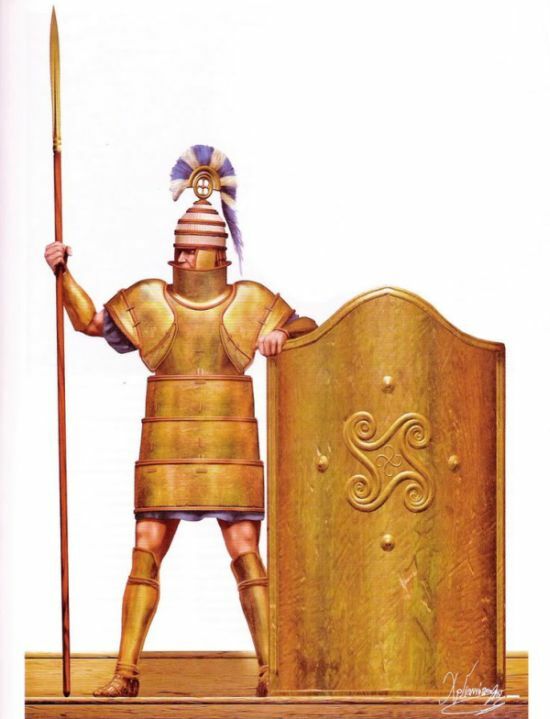 In fact, the ‘heaviness’ of the Mycenaean heavy spearmen didn’t stem from their armor (which usually consisted of only a kilt or a loincloth), but rather came from the sturdy shields employed by these warriors. In that regard, most pictorial depictions showcase two varieties of shields being used by the soldiers – the tower shield with its simple rectangular form and the ‘figure-eight’ shield with its stylish shape replicating the number 8. Both of these shield types reached from the neck level to the foot, thus aptly flaunting their defensive credentials. Mostly made from wooden frames reinforced with wickerwork and then draped in animal hides, the large surface area occupied by the front facades of the shields made their function clear. Basically, the large coverage allowed the warrior to be protected from most offensive weapon types like spears and swords, while also endowing him with cover from projectile weapons like slings and bows. But of course, such large shield surfaces (along with their substantial weights) intrinsically hindered the mobility of the spearman. These characteristics suggest that the infantry ‘backbone’ of Mycenaean armies employed disciplined, massed formations on the battlefield, as opposed to lightly-armed, disorganized mobs clashing with each other. Moreover, the pronounced boss (primarily made of wood or toughened leather projections) of the ‘figure-eight’ shield, along with the facade’s special curves, allowed the more shock-oriented troops to ‘pry open’ the enemy formations. This was further complemented by the slightly concave shape of such shields that rather strengthened their deflective capacity from melee blows and arrows. 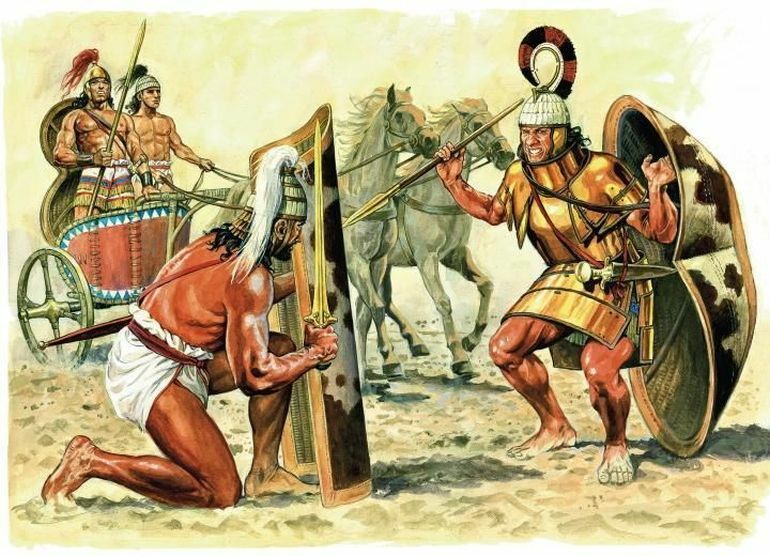 We mentioned before how the ‘heavy’ status of the early Mycenaean spearmen came from their sturdy shields and weapons, as opposed to hefty armor systems (that were mostly eschewed in favor of light clothing). But while the shield could cover most part of the body, the head was still exposed to blows in a melee situation. 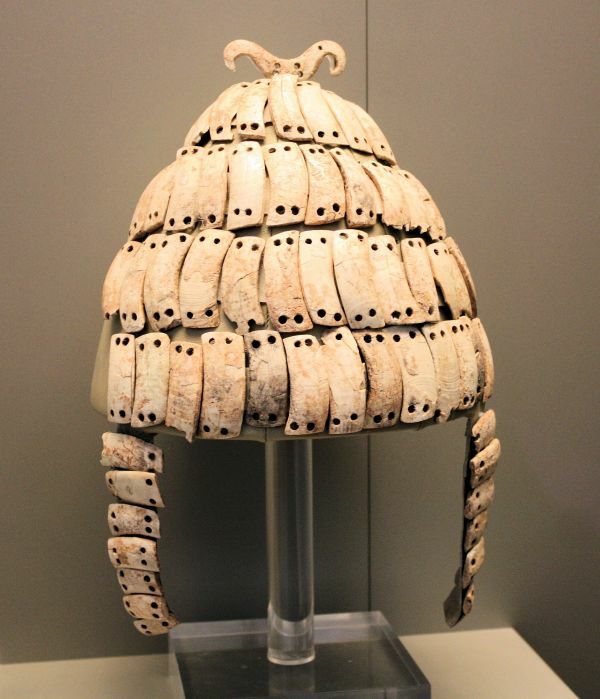 This is where an Aegean invention came to the fore, in the form of the special boar tusk helmet. Giving a literal meaning to their name, these helmets were actually reinforced with the hardy tusks of boars – which were primarily shaped in smaller pieces, bored with holes and then expertly stitched on a conical leather framework. Special care was taken to alternate the curves of these shaped tusks in the concurrent rows, while the crown was embellished with a plume or a knob. Some of the specimens possibly even had extending cheek guards, thus accounting for a formidable head defense. Interestingly enough, Homer makes a full description of such boar tusk helmet types and their prevalence in the Trojan War. He also goes on to explain how the ‘Greeks’ (or Mycenaeans) acquired these tusks due to their penchant for hunting. In any case, from the historical perspective, like many things Mycenaean, such helmet types were probably inspired by the advanced Bronze Age Minoans. Till now we had talked about how the ‘backbone’ of the Mycenaean armies comprised the heavy spearmen. But such tight formations were not always effective, especially when dealing on an uneven terrain or when fighting a more mobile enemy. Thus came the requirement of lightly-armed skirmishers who were tasked with screening the main body of the army. However, as Grguric mentioned, the Mycenaeans also developed another body of dedicated light infantry troops, and they were the sword bearers. Tactically filling the gap between the heavy troops and the very light skirmishers (who were not expected to fight in melee situations), these dedicated swordsmen usually operated in loose formations, and often engaged enemy troops over undulating terrains and obtrusive fortifications. Quite intriguingly, one particular cylindrical seal depicts one such swordsman who is about to deal a killing blow to his reclining opponent (a heavy infantryman with a figure-eight shield). Now historically in the ancient times, the lighter the troop was, the more economically constrained he was supposed to be – with individual property deciding the type of armament a soldier could afford (except in rare occurrences). But in the case of this depiction, the swordsman is portrayed as the ‘superior’ warrior in his nigh heroic pose defeating an opponent. 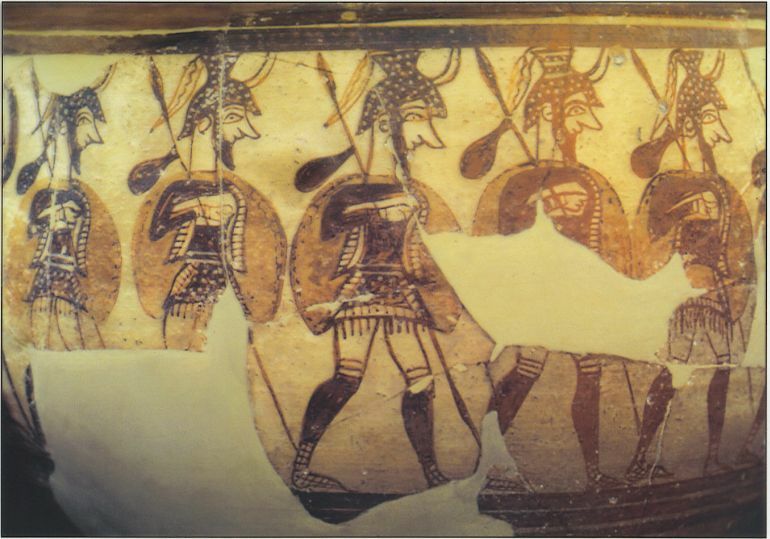 Some other Mycenaean depictions also follow a similar pattern of representing these troops in a better light. This scope alludes to the credible hypothesis that the ‘light’ swordsmen probably enjoyed higher status than that of the regular heavy infantry, and as such, they were often referred to as the promachoi (or ‘champions’). 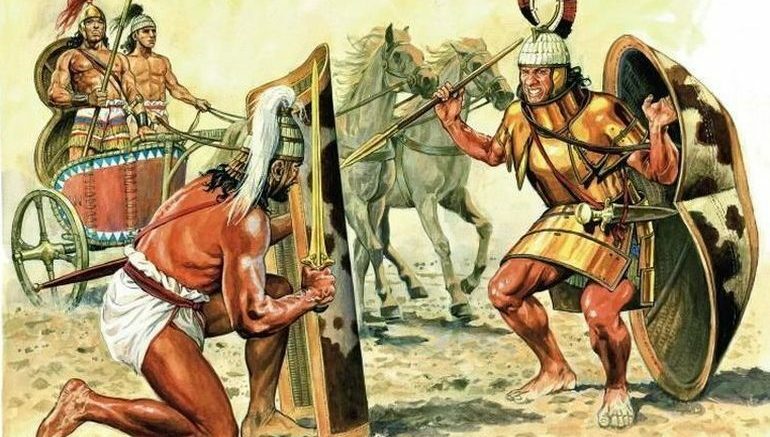 From the tactical perspective, such exaltation does make sense, since the Mycenaean swordsman was a dedicated and flexible fighter who was possibly prized for his specific role on the battlefield, especially in rough landscapes. The one major military ambit that differentiated the Mycenaeans from their later Classical Greek counterparts was the adoption of chariots. As a matter of fact, the Mycenaean army preferred the sturdily-built, heavy chariots that were conducive to operating on the rocky plains along the Mycenaean homeland. This translated to use of robust four-spoke wheels and draught pole reinforcements with cross-bracing. Consequently, there were few types of chariot designs, but most of them were drawn by two horses – which was a far cry from the larger Assyrian battle chariots used during their hey-day. 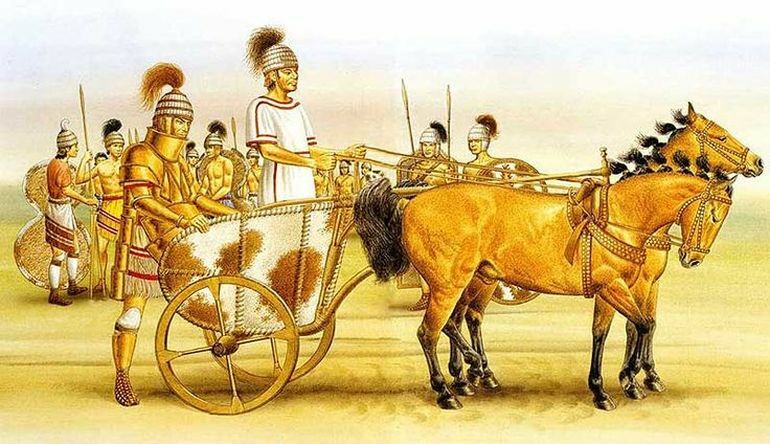 In any case, beyond the chariot type, it was the tactical scope used by the Mycenaean charioteers that are more relevant to our discussion at hand. To that end, most depictions show archer/archers being mounted atop these vehicles without drivers (though in reality that was improbable, since handling weapons and guiding a robust wheel-drawn craft through a battlefield would have been very difficult). Historians have additionally drawn hypothesis on how such chariots could have also carried spearmen – who might have flung their spears or used them as lances like medieval knights. The tactical scope still raises the question – how exactly were the chariots effectively used in an actual battlefield scenario? Due to lack of any direct evidence and relatively lesser number of chariots fielded by the Mycenaean army (because of the rough terrains of Greece), one of the possibilities hint at how the chariots were employed as super-heavy shock weapons. Almost mirroring the shock cavalry charge of much-later times, the impact of these heavy crafts was possibly related to their imposing stature as the rumbling vehicles that vigorously dashed at the disorganized infantrymen of the enemy camp. Simply put, it was the psychological affliction and fear of being impaled by a charging heavy chariot that broke enemy formations, rather than the actual momentum of a physical impact (which could have been fatal or injurious for the charioteers themselves). Most of the Mycenaean military aspects we covered till now coincided with the period between 1600 – 1300 BC. However, on arriving closer to the presumed date of Homer’s Trojan War (circa 13th century BC), archaeological evidence suggests a substantial change in the arms and armor system of the Mycenaean army. One of these changes pertains to the adoption of newer shield types in place of the iconic figure-eight (and tower) varieties. These new patterns, arguably more flexible, comprised the famed aspis (circular shield) and inverted pelta (almost circular, but with a cut-out at the bottom). Subsequently, the elongated spear was also ditched in favor of shorter spears (5-6 ft lengths) that could be easily wielded by a single hand. 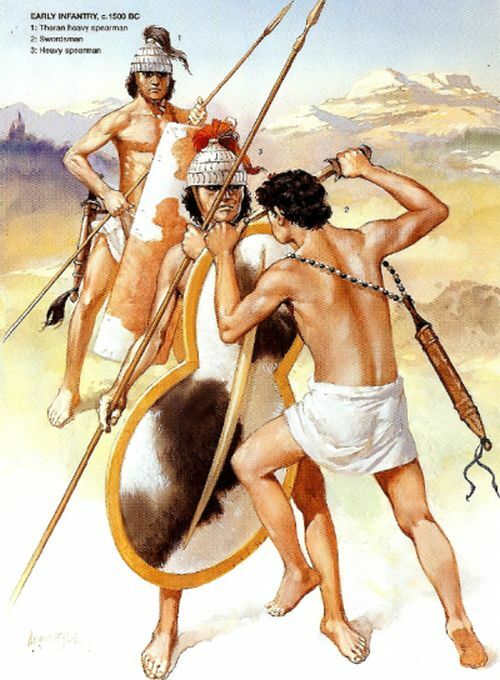 Some spearmen might have also carried swords (of the slashing variety), thus hinting at an ‘evolved’ Mycenaean warrior expected to be ‘accustomed’ to various battlefield scenarios. The smaller type of adopted shields also fueled the need for dedicated body armor. 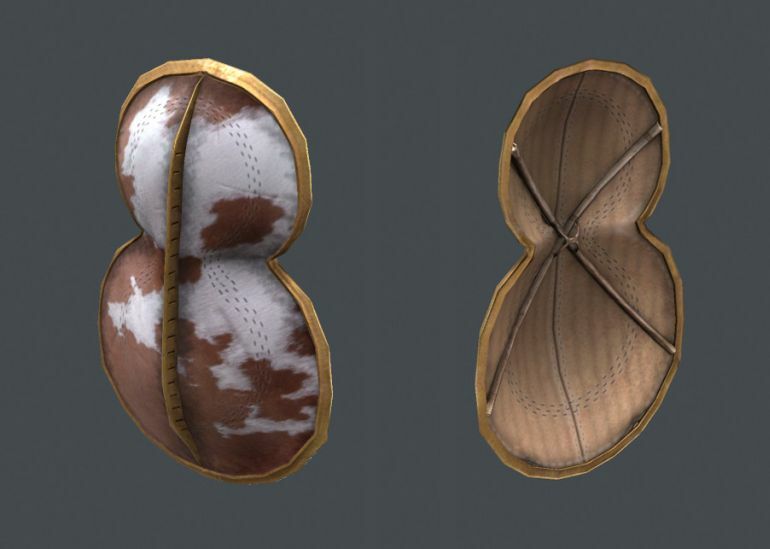 One of these armor systems consisted of a leather corselet that was reinforced with sewn bronze (or copper) scales, and it was possibly worn over a leather skirt. The Mycenaeans even seemed to have adopted greaves for a short period of time circa 1250 BC, though these small leg-defenses were abandoned by the end of the century due to their relative ineffectiveness in actual battles. As one can comprehend from the changes in equipment, the ‘new’ Mycenaean army of 13th century BC was developed to cope with flexibility in tactics. Now from the historical angle, such far-ranging alterations in the military were possibly made to deal with a newer type of threat that went beyond mass battlefield formations. 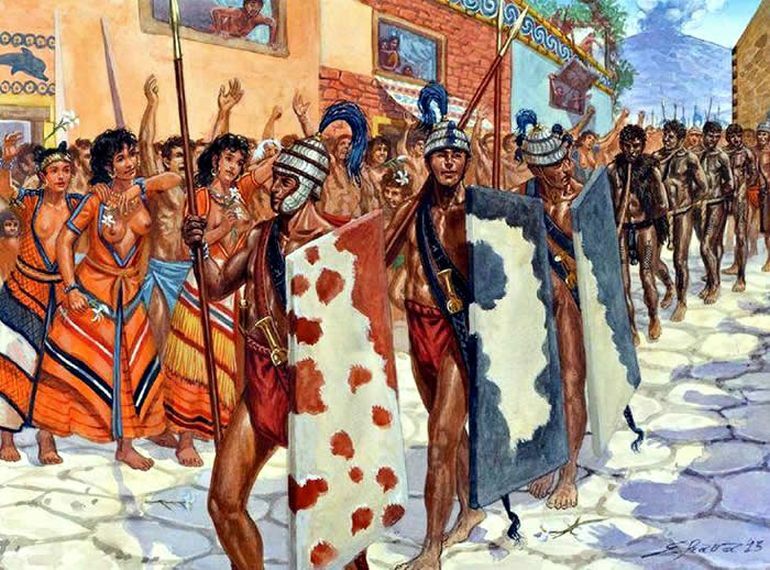 Much like the Anglo-Saxon response to Viking raids, the Mycenaeans of these times preferred small batches of soldiers who were easily available to defend the coastal areas – as is evident from the Linear B tablets of the 13th century BC Pylos. Concurrently, the late 13th century (and early 12th century) also saw the rise of fortified architecture in major Mycenaean settlements, with massive stone ramparts being constructed to protect their citadels and palaces. In any case, after just a few years, the palace at Pylos was destroyed, circa 1180 BC. Soon after, most of the other Mycenaean sites and settlements were also destroyed – and this sudden eclipse of a thriving Bronze Age culture is still one of the puzzling mysteries of time yet to be solved by historians. Suffice it to say, there are debates in the academic world that relate to the hypothetical reasons behind this sudden ‘mass’ demise of a civilization (so much so that Greece was thrown into a dark age for almost three centuries, till 9th century BC). Some of these conjectures bring up the familiar narrative of the invading Dorians and the mysterious forays of the ‘Sea People‘, while others hint at climatic changes and social revolutions. In few of the above images, we can have a glimpse at a curious full body armor encased in robust bronze plates. Now, this is not a figment of the imagination of the illustrator, but rather depicts the incredible specimen of what is known as the Dendra panoply. Named so because of the discovery of the earliest of these fascinating specimens in the village of Dendra in the Argolid (see actual image here), the armor system was probably developed from the late Mycenaean period (or at least after 15th century BC). This uncovered specimen in question consists of fifteen separate sheets of beaten bronze that were fastened by leather bands. The main cuirass in itself comprised two different facades (for front part and rear part of the torso) that were joined by a hinge. Additionally, the impressive armor system boasted big shoulder-guards, triangular arm-pit guards, a deep neck-guard (composed of a high bronze collar) and even greaves (padded with linen). So after all these pieces were ‘set up’, the complete panoply equated to a robust, full-covered plated body armor that may have been imposing in its scope, though surely cumbersome in its usage.